When looking at the pros and cons of these two power options, ultimately, we recommend the AC electric powered stair lifts over a DC battery-operated lift; although, there is one distinct advantage for a battery-operated lift. A battery-operated lift has the ability to make about 8 to 10 trips up and down a set of stairs, if the power happens to go out. So if you think that going up the stairs during a power outage is an absolute necessity, a batter-operated lift may be right for you. In order to make sure that the batteries are always charged, a battery-operated lift must be plugged in at all times, just like an electric powered lift. Most of the batteries used in these lifts will need to be replaced in a little over a year, depending on the frequency of use. Replacing the battery on these types of lifts is fairly difficult and it is recommended that a professional does the job to ensure your safety. The wires connected to the battery are relatively short, and can easily become disconnected during a replacement. If one or some of these wires are not connected properly, the safety features of the lift may not work correctly or at all. One of the safety features stops the lift if your foot is between the footplate and the next step. If this feature were to be disabled due to an inexperienced battery install, a terrible accident could occur. Therefore, it is highly recommended for an experienced technician to do the job and not anyone else. Another disadvantage to battery-operated stair lifts is the instance(s) that the voltage converter can burn out over time. The voltage converter is a cord that regulates the amount of current coming through the cord. Most lighting devices have this same converter. This is another occasion when a service call will be needed. Without the voltage converter working properly, the battery will not charge and could leave you stranded at the top or bottom of the stairs. 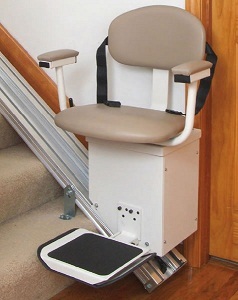 Overall, battery-operated stair lifts are not recommended unless you live in an area prone to power outages or live in a home with special power limitations. When something goes wrong with your batter-operated lift, call an experienced installer in order to ensure your safety. One major advantage for AC Electric Power Stair Lifts is that they are significantly less expensive than battery-operated stair lifts. On top of that, they require less service calls related to battery and converter problems. On a battery-operated lift, the lift will slow down as the battery drains. This will not happen with an electric stair lift. Also, wiring is much more durable in an electric stair lift as opposed to battery-operated.